First off, I will tell you I have attempted to not post pictures or write anything particularly gruesome in this post, but please be fore-warned if you are squeamish or eating your lunch, there are chicken bodies in some pictures, so scroll down at your own risk. ept 8th was a big and long-looked-to day at the farm as we butchered the 100 chickens we had been raising over the summer. We have always butchered our own animals. Me and my siblings have been helping with this work since we were toddlers and it is one of the jobs that my large family has learned to do as a team fairly well. When I was a kid, I rued the day in early fall that we would butcher the summer chickens, one or two hundred of them in one day. The aspect of my extended family coming over to the farm to help should have helped offset the angst, but I cannot express to you how much it distressed me. This year I made note of the fact that I was looking forward to it, other than the stress of moving all of my collected studio and barn debris upstairs into the hayloft to make room to do the butchering in the barn as usual. I don’t take pleasure in killing animals, neither at this point, after almost 30 years of it does it make me feel bad. I was looking forward to working with all my siblings and my grandparents together. These days the chickens are raised to fill the freezers of mostly my immediate family and just two of my Dad’s brother’s families and my grandparents in addition. I love my siblings dearly and cherish each opportunity that I get to see them. We always have a good time with each other, and we have our butchering system down so well, that it is quite a light-hearted affair. Some of the best visiting happens when you are working side by side with someone at something like weeding a garden, or, pin-feathering chickens. At right is my mom and my sister Paula washing the insides of chickens in cold water tubs –>. One of the things I appreciate about being at the farm is being closer connected to a reality of hard work and living things. The process of butchering chickens includes killing and bleeding them, dunking them in a hot water bath, plucking their feathers, gutting them, washing out their interior cavity and pin-feathering them, and then cutting them into pieces and packaging them for the freezer. When we have to butcher a few at a time we may pluck the feathers by hand, but when we butcher the mob of them, we use my grandfather’s old chicken-plucker. 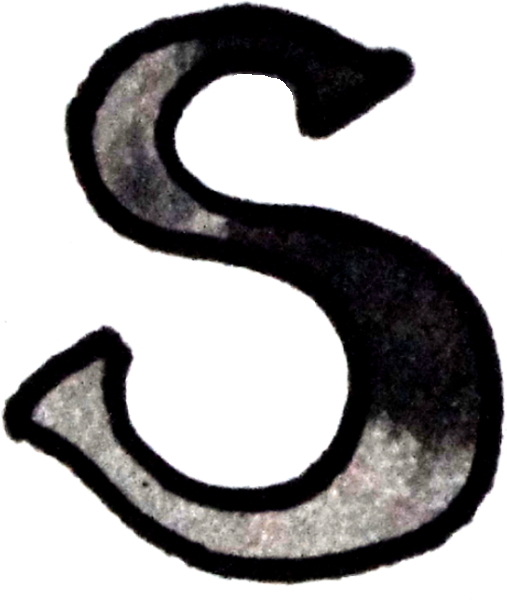 It is a rotating rubber drum with long rubber fingers sticking out in all directions and the chicken is sort-of surfed over the spinning fingers, which pull out the feathers, hopefully without tearing the skin. My brother in law, Kyle, has been being trained in at the plucker by my grandpa for a couple years –>. 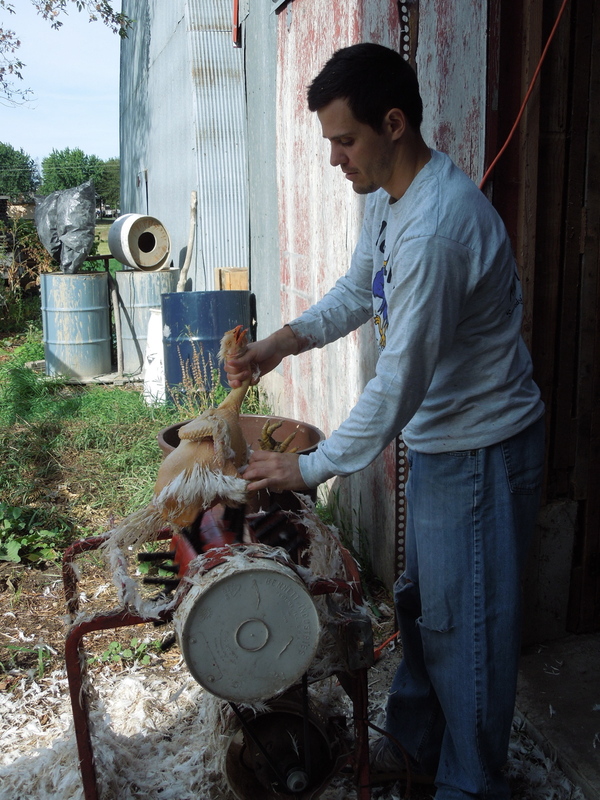 It takes practice to get good at it, and the temperature of the water that the chickens are scalded in plays a role. It should be 150 degrees or so for the feathers to come out, but keep the skin intact. After the chickens are de-feathered and gutted, they are put into a tub with very cold water, and when chilled, the inside cavity is thoroughly cleaned by hand, and the outside of the bird is perused for tiny feathers (pin feathers). Then they are put back into cold water (we use a no-longer-working chest freezer to hold over 50 at a time). We finished butchering all the chickens in the morning this year, broke for lunch, and after lunch and after cleaning all of the tables and equipment, cut them into pieces and packaged them in freezer bags and paper. If you would like more detailed information about butchering, you could shoot me an email at meyerfarmproject@gmail. 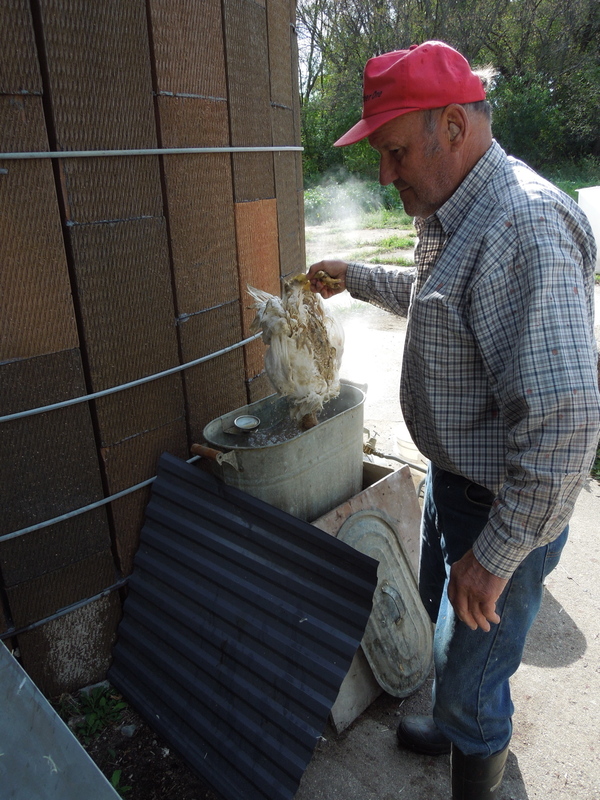 Here’s Grandpa with his scalding station, the pieces of tin are there to shield the gas burner below from the wind. And here’s my sister Missy checking Kyle’s work at the -> plucker. My brother and brave young cousin bring chickens from the coop to the back of the barn. Here’s a look down the barn at the washing stations on the left, and the gutting stations on the right. My Dad is especially talented at organizing labor, space, equipment and processes. He is the reason the job went so smoothly. 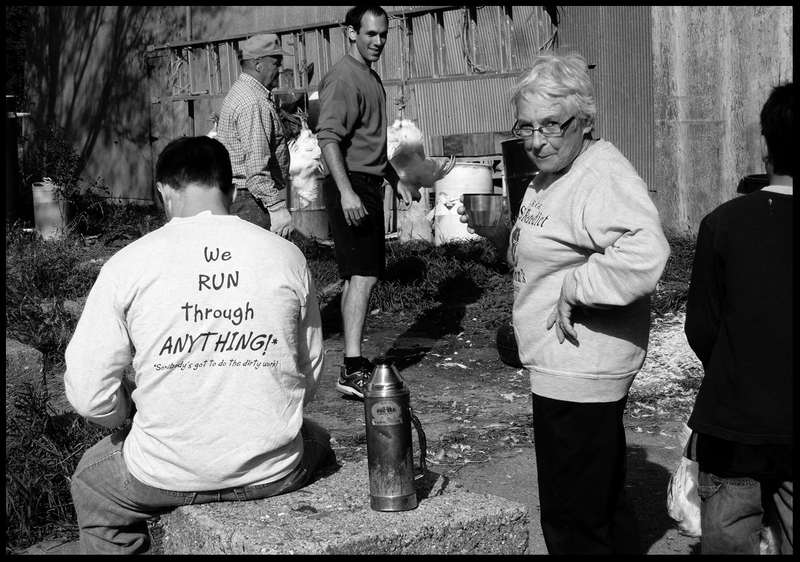 Lastly, we have our vigilant Supervisor, Granny Grunt, who is trying to figure out who emptied the thermos of coffee. My money is on Joe Meyer. I apologize if I have offended anyone in my effort to document how life is lived at the Meyer Farm. I believe the animals here have always been raised and killed as humanely as possible, and I admire people who do this work to feed themselves.